Place chops in large, resealable bag; pour vinaigrette dressing over. Seal bag and refrigerate for 2 to 24 hours. Remove chops from marinade and pat dry. Discard remaining marinade. Grill chops directly over heat for about 8 to 10 minutes, turning once. 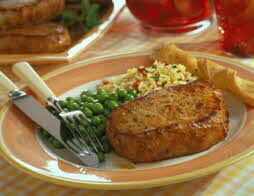 Serve desired number of chops for dinner; wrap and refrigerate remaining chops for up to three days. Use leftovers with Stovetop Calzone, Grilled Pork Panini, or Tuscan Pork and Bean Salad (in Salad category). These flavorful chops can be put in the refrigerator in the morning to marinate and be ready for the grill after work. Serve with seasoned rice, peas and breadsticks.